Shares of burger and milkshake chain Shake Shack sank by as much as 15% in after-hours trading after it posted an unexpected sales decline. The fast food company said revenue at existing stores fell 2.5% after cold weather in the US Northeast hurt sales. Profits were $2.3m (£1.8m) in the quarter, up 55% year-on-year. Chief executive Randy Garutti said the firm was still expecting strong overall growth in 2017, but conceded: "We are clearly dissatisfied." The New York company expects new stores to help fuel growth. Shake Shack, which started as a hot dog stand in a Manhattan park and quickly grew a cult-like following, has already opened two shops in London this year. It plans to open up to 36 new sites globally in 2017, adding to its more than 100 locations around the world. 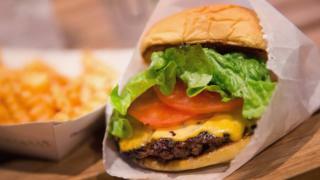 Shake Shack was not the only US food company reporting weaker-than-expected sales on Thursday. Dunkin Donuts said its sales at established stores in the US were flat. Net income rose 28% year-on-year to $47.5m. The results came amid an "increasingly challenging environment for retail and restaurants," Dunkin' Brands chief executive Nigel Travis said.